Please prepare your exchange so that you can arrive and stay for the whole term or sitting period at Oulu UAS, as mentioned on our websites or in our letters of acceptance. Kindly note that physical presence is required for the entire exchange, including mandatory orientation days. You have to stay at Oulu UAS to complete all learning activities as planned in your learning agreement and based on the implementation of your studies and/or traineeship in our university. This guarantees that the aims of your studies or traineeship can be met by all parties, and that you are able to fulfill the requirements of, e.g., the Erasmus+ or other mobility programmes. In order to help you preparing your exchange, travelling to Oulu, and making your arrival and stay at Oulu UAS pleasant and rewarding, our student union OSAKO and our International Services are organising international peer tutoring and will be assigning a peer tutor to you. Your peer tutor is a degree student of Oulu UAS who will contact you before the exchange and stay in touch with you during the exchange, serving as a guide to the local student life in Oulu. He/She will be ready to welcome you at the Välkkylä dormitory (or other place if you haven't been able to get accommodation from PSOAS) during the official arrival days and times, see below. We will assign a peer tutor to you shortly before the commencement of each term. You may then carry out different student-led activities with your peer tutor before, during and even after your exchange at Oulu UAS. For more information, please refer to the section “International Tutoring” on the page “Studying at Oulu UAS”. We will be using Excel lists to share information about assignments of international peer tutors. 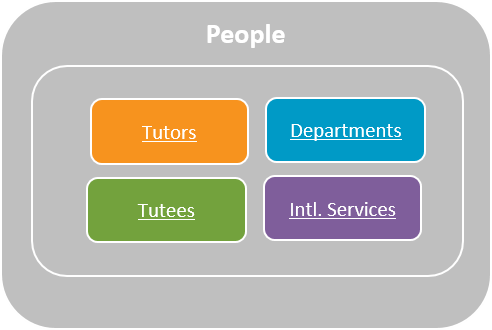 See the people and process chart of international tutoring as follows. For a higher resolution, kindly click on the aforementioned linked files. Please let us know your arrival information by 4 August at the latest for autumn, and 16 December for spring. You will be e-mailed a link to an internally shared Excel list by which you must provide your arrival information. You can access the link with your browser and add relevant information on your part (arrival day, time, place and means of transportation, as well as your place of accommodation). Our tutors are updating the shared Excel list as well during the summer for the autumn term, and during autumn for the spring term. Our tutors will sign up for, or will be assigned to you and other exchange students by International Services. We from International Services will send a confirmed assignment message with contact information (e-mail and mobile phone number) in a separate e-mail to you and your peer tutor at the latest in the middle of August concerning the autumn term, and in the middle of December concerning the spring term. We are using the same internally shared Excel list in our assignment message. Once you have received the assignment message (shared Excel list) with the confirmation from International Services, immediately contact your peer tutor by e-mail and phone, and provide him/her with your mobile phone number and other relevant contact information. We’re using a facebook group for all exchange students and peer tutors of Oulu UAS – feel free to join it at https://www.facebook.com/groups/oulu.uas.exchange.students.autumn.2018. In spring the link will be https://www.facebook.com/groups/oulu.uas.exchange.students.spring.2019. In case of changes in your travel arrangements, swiftly inform your peer tutor and incoming.students@oamk.fi about it by phone and e-mail. Our international peer tutors will be ready to meet you during the aforementioned times at our student union OSAKO’s office. OSAKO’s office is located close to PSOAS’ Välkkylä dormitory, where most of you will be staying during your exchange. You can find OSAKO’s office easily – whether you will be arriving to the Oulu Airport, Oulu Train/Bus Station or directly to OSAKO’s office by your own car or other means of transportation. Kindly note that it is not possible to stay overnight at the Oulu Airport, as it is closed between 2 am and 4 am! If you are arriving at other times, you must organise transportation and stay at a hostel/hotel in Oulu, see http://u.oamk.fi/accommodation. Arrival services outside the official arrival days and times are not possible, but if you have not been offered or haven’t accepted a room at PSOAS’ Välkkylä dormitory, you may approach your peer tutor and enquire about possible assistance during the arrival times. If your accommodation at the Välkkylä dormitory has been confirmed by PSOAS for the official tenancy periods (1 August for autumn, and 1 January for spring, moving in as early as 2 January! ), then your room key will be available at OSAKO’s office during the aforementioned official arrival days and times. Your assigned peer tutor or another peer tutor who is available at OSAKO’s office at your time of arrival will then lead you to your room. Please note that the arrival services applies only to your arrival to Oulu (not to the departure from Oulu), and that you have to cover your own travelling expenses in all cases. If you have not received or accepted a room at PSOAS due to the capacity limits of the Välkkylä dormitory (150 rooms), please search for housing as instructed at http://u.oamk.fi/accommodation > “What if…”. PSOAS's keys for vacant rooms and tenancies as of 1 August at the Välkkylä dormitory are delivered to OSAKO's office on 13 August. Please contact OSAKO and pick up the key yourself during office hours (Mon-Thu 10-16, Fri closed!) or, if possible, your peer tutor may pick up the key for you and meet you at the dormitory at a mutually agreed time. Please make arrangements directly with OSAKO or your peer tutor for picking up the key. Check OSAKO’s opening hours from the following website: http://www.osakoweb.fi/en/contact/#toimisto (Mon-Thu 10-16, Fri closed!). Tenancy agreements must be made during the joint orientation day of Oulu UAS - PSOAS joins the event on 23 August. Bring your ID document (passport or other ID) to the orientation day for signing the rental agreement with PSOAS! PSOAS's keys for vacant rooms and tenancies as of 1 January (move in 2 January) at the Välkkylä dormitory are delivered to OSAKO's office on 2 January 8 - 10 am. You can pick up your key from OSAKO yourself during arrival service hours, 8 am - 22 pm. Peer tutors will be at your disposal in OSAKO's office and will guide you to your room in the Välkkylä dormitory. On 2 January between 9 am and 3 pm also representatives of Oulu University of Applied Sciences International Services and PSOAS will be at your disposal in OSAKO's office. Devise your tenancy agreement during the joint orientation day of Oulu UAS - PSOAS joins the event on 3 January. Bring your ID document (passport or other ID) to the orientation day for signing the rental agreement with PSOAS! In general, you may ask your peer tutor for assistance and mutually agree with him/her to pick up your key on your behalf, if you have obtained housing from PSOAS. If your peer tutor is available, you must then authorise or endorse him/her to PSOAS by e-mail, and only then your peer tutor may pick up the key for you, and meet you at a place mutually agreed. Kindly note, however, that our peer tutors are normally only available to help out with obtaining and providing keys etc. during the regular arrival days and times, and only from PSOAS. If you have received accommodation on the private market, please check with your housing provider and your peer tutor, whether the key can be picked up on your behalf and what kind of conditions apply for authorising or endorsing your peer tutor to pick up the keys on your behalf, and when and where you must sign the rental agreement by yourself. Oulu UAS arranges orientation days for you and all incoming exchange students. Participation in orientation days is mandatory, as they are an excellent way to start your exchange and get to know each other. 3 & 4 January 2019 (Check the programme and map. 1 March, intake option only for designated partner universities, separate programme and map! You will take part both in a joint orientation day of Oulu UAS, and in a campus- and field-specific orientation day. In addition, some study programmes (e.g. Demola, Oamk LABs, Terwa Academy) may involve additional kickoff meetings in the first weeks of your studies. The student union OSAKO and field-specific student organisations will be organising events and trips during the exchange, so that you feel welcome! Our joint orientation day offers you plenty of practical information on living in Oulu and making your way at Oulu UAS (accommodation, student health care, services for students, student union OSAKO and ESN). It consists of morning sessions with presentations and a market place event with interactive stands in the afternoon, as well as an Oulu city tour by bus. You will receive other administrative documents at your check in meeting with your international administrative coordinator on our campuses during the first week of your exchange studies, see section "Check in meeting"
Our campus- and field-specific orientation day provides you with detailed information on your studies/traineeship/project works/art/event productions. You will take part in a morning session with international administrative coordinators (International Services). Our peer tutors will offer a campus tour or other student-lead activities. Our field-specific international academic coordinators will have a study information session in order to share information on academic conduct, ethical guidelines, as well as your course choice, schedules and other possible timetables. They will refer to your course choice based on your learning agreement (before the mobility) and advise you concerning course enrolments etc. The learning agreements (before the mobility) have been usually confirmed after your admission by international administrative coordinators (International Services). In case of changes of courses, you must turn to your field-specific international academic coordinator and a representative of your home university to approve of the changes, and then e-mail the signed learning agreement (during the mobility) for signature to all relevant parties. For more detailed information, please check and follow our instructions in the section "Learning Agreement (before, during and after the mobility" on the page "Studying at Oulu UAS". More detailed information about the orientation days and other events is also provided by e-mail, our facebook group for exchange students, and via the web pages of Oulu UAS. In short: Here is a short infograph, but please read also the information below it. Make your booking once you have obtained your teaching or working schedules during or shortly after the orientation days for the following 1-2 weeks, see information below. If you are coming at other times (trainee, exceptional intake options for students in certain fields), then please agree by e-mail or phone on an individual meeting with your international administrative coordinator. Check the responsibilities and locations! Some universities require their students / trainees to fill in and send a document giving proof of the arrival and commencement of their exchange on the template of their home university. Check with your home university, whether such a document is required. If required, please bring it to the check in meeting or e-mail it beforehand to your international administrative coordinator. N.B.! Only some universities require such a document and these may be termed in different ways. If you have arrived for exchange studies for regular term dates, you should have received your enrolment/study certificate during Oulu UAS orientation days. If you haven't received it during the orientation days or if you have arrived later, you can get this document from your international administrative coordinator at your check in meeting. Check that you have a copy of this document - you should have received it with or shortly after the admission e-mail by Oulu UAS. If you do not have a copy, please talk to your international administrative coordinator at your check in meeting. If you have changed or are planning to change your course choice and enrolment (adding or deleting courses), please meet your international academic coordinator/traineeship supervisor, and follow the process outlined in the section "Learning Agreement" on the page "Studying at Oulu UAS". Arrival form to Oulu UAS (yellow form, distributed during orientation, or links below!) with your Finnish personal identity code (PIC) and insurance documentation, to be returned to your international administrative coordinator in the first four (4) weeks of your exchange! Return the form to your international administrative coordinator once you have obtained your Finnish personal identity code (PIC). You can return the form by e-mail or in person during service hours of International Services, normally Tue-Thu 9-11 and 12-14! It is also possible to leave it in the drop or mail box outside the offices. In the beginning of your studies you must take care of certain administrative matters and documents. Administration is intended to make your life easier and thus ensures a good start to your exchange studies or traineeship at our university and in Oulu. Please book a check in meeting with your international administrative coordinator for the first week of your studies/traineeship. The booking link will be available here during the orientation days. If you are coming later than ususal (trainee, exceptional intake options), then please individually agree on your check in meeting with your international administrative coordinator. In addition, please make an appointment with your international academic coordinator or traineeship supervisor to find out about matters related to your studies or traineeship. Kindly note that physical presence is required for the whole term or sitting period of your exchange. You have to stay at Oulu UAS to complete all learning activities as planned in your learning agreement and based on the implementation of your studies and/or traineeship in our university. This guarantees that the aims of your studies or traineeships can be met by all parties, and that you are able to fulfill the requirements of, e.g., the Erasmus+ or other mobility schemes. In case learning activities end a few days earlier than planned on the part of Oulu UAS, you can leave our university a few days before the official end of the term or sitting period, and it will not have an impact on Oulu UAS' statements of duration of your stay. If learning activities last longer than planned, then you must devise the learning agreement (during the mobility) and consult all parties at Oulu UAS and your home university about an extension of your stay. An extension of your stay may have an impact on your Erasmus+ or equivalent grants of mobility schemes. Physical presence is required as long as learning activities last. In case you have questions, please contact Oulu UAS' International Services (incoming.students@oamk.fi) respectively your international administrative or academic coordinator at Oulu UAS.